Raise the Inflation Target and Put a Date on It! Raise the Inflation Target and Put a Date on It! That’s the direction some high-profile economist and former members on the FOMC want to go. According to these academics, including Narayana Kocherlakota the former president of the Federal Reserve Bank of Minneapolis from 2009 to 2015, raising the inflation target just isn’t enough. They want to put a time horizon on it as well. In other words, they want to raise the inflation target higher than the current 2% level, and then place a firm date as to when that inflation goal must be achieved. Their rational for doing both actions is to reduce the level of real interest rates, which they somehow believe is the progenitor for viable GDP growth. You see, once the Fed has taken the nominal Fed Funds Rate to zero, there isn’t much more room to the downside unless these money manipulators assent to negative nominal interest rates. But charging banks to hold excess reserves is fraught with danger, and so far this idea has been eschewed in this country and has been proven ineffectual in Europe. The Fed wants the flexibility to make real interest rates more negative than the minus 2% that would be achieved at the zero-bound rate when using the current 2% inflation target. The next recession could be just around the corner and the Fed is thinking about ways to stimulate the economy given the fact that the amount of ammunition--the number of rate cuts until the F.F.R. hits zero percent--is extremely limited. With very little leeway available to reduce borrowing costs, these mainstream academics want to facilitate more negative real interest rates by ensuring inflation is higher right from the start. The math is simple: a three percent (or higher) inflation rate would equate to at least a minus three percent real F.F.R. once the nominal rate hit zero. But as to why these Keynesian academics are so convinced a lower real interest rate is better for economic growth is never clearly explained. Probably because it is a nonsensical tenet and the biggest fallacy in all of central bank group think. Their spurious logic dictates that a lower unemployment rate is the primary cause of rising rates of inflation and that a higher rate of inflation is supportive for lowering the unemployment rate. Exactly how this simple model arrives at that conclusion is never cogently explained; other than the mistaken belief that inflation and growth are synonymous terms. 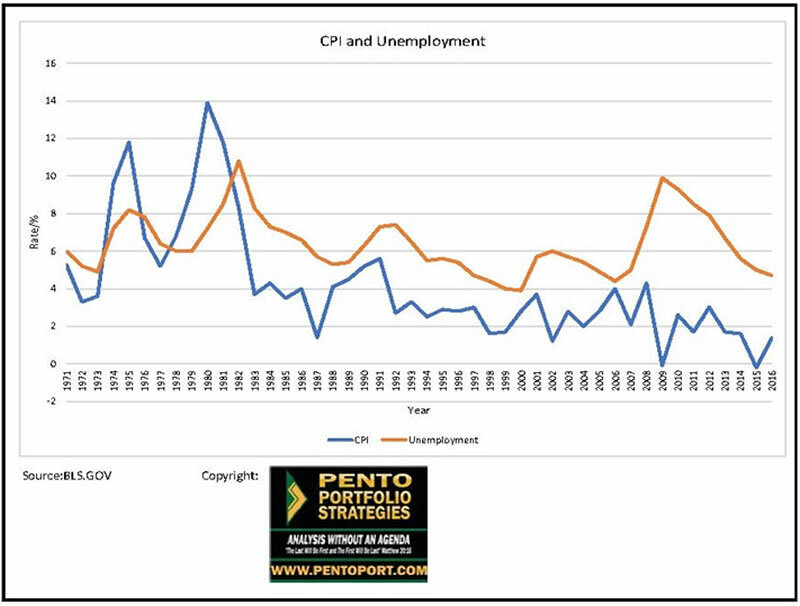 But history and genuine economics clearly illustrate that inflation does not bring about growth, nor does it necessarily lower the unemployment rate. In fact, a rising rate of inflation often leads to higher rates of unemployment. This is the exact opposite of the Phillips Curve dogma held at the Fed, which dictates that a falling unemployment rate is the totality of inflation. The reality is that the humongous amount of new credit pumped into the system by global central banks has primarily landed in financial assets, not consumer price inflation. Despite all this money printing, the Fed’s preferred inflation metric (Core PCE Price Index) is still below its 2% target. Therefore, the asset price collapse and CPI plunge resulting from this next recession/depression should result in a new form of QE called helicopter money. Central banks will purchase assets directly from the public or the Treasury instead of through the banking system. In other words, getting new money into the public’s hands causing an increase in broad-based money supply and inflation. The next stock market plunge and concomitant GDP collapse is approaching quickly. The Fed is preparing investors for its ultimate response; which will be to guarantee a higher inflation rate and to put a timestamp on it as well. But those efforts will only vastly exacerbate the stagflation condition suffered by the middle class. Those that possess a keen insight to the direction of markets are aware of this phenomenon and are moving into precious metals now; while they are still able to afford them. Michael Pento is the President and Founder of Pento Portfolio Strategies (PPS). PPS is a Registered Investment Advisory Firm that provides money management services and research for individual and institutional clients. Michael is a well-established specialist in markets and economics and a regular guest on CNBC, CNN, Bloomberg, FOX Business News and other international media outlets. His market analysis can also be read in most major financial publications, including the Wall Street Journal. He also acts as a Financial Columnist for Forbes, Contributor to thestreet.com and is a blogger at the Huffington Post. Prior to starting PPS, Michael served as a senior economist and vice president of the managed products division of Euro Pacific Capital. There, he also led an external sales division that marketed their managed products to outside broker-dealers and registered investment advisors. Additionally, Michael has worked at an investment advisory firm where he helped create ETFs and UITs that were sold throughout Wall Street. Earlier in his career he spent two years on the floor of the New York Stock Exchange. He has carried series 7, 63, 65, 55 and Life and Health Insurance www.earthoflight.caLicenses. Michael Pento graduated from Rowan University in 1991. Disclaimer: The above is a matter of opinion provided for general information purposes only and is not intended as investment advice. Information and analysis above are derived from sources and utilising methods believed to be reliable, but we cannot accept responsibility for any losses you may incur as a result of this analysis. Individuals should consult with their personal financial advisors. © 2005-2019 http://www.MarketOracle.co.uk - The Market Oracle is a FREE Daily Financial Markets Analysis & Forecasting online publication. The Market Oracle is a FREE Financial Markets Forecasting & Analysis web-site.